The quest team's journey to find Joshua has begun, but all hell literally breaks loose when a certain well endowed Fraulein and an old enemy both show up on the train. As the jaws of a nightmarish trap snap shut only the Magdalene Order's elite training will keep them alive, but is even that enough? The forces of good may be hopelessly outmatched! 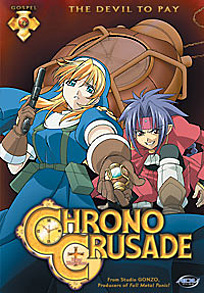 DVD Features: English 5.1 Audio, clean opening and closing animation, Azmaria's Extra Classes, a Chrono Crusade Chronicle, production sketches, and previews.